OK. I am about to seriously overshare... Our bathroom is really really horrible. I've taken really horrible photos of it to prove it's horribleness. And for the record, we do clean in here regularly, but it's kind of a lost cause... You finish cleaning, and it just still looks icky. Justin and I have pipe dreams of making changes in there, but absolutely no budget for it. I'm really wondering if I could DIY the tiling... Is it that hard? I would love to have penny tiles on the floor, and just some nice clean white ones on the walls, with maybe some small black and white tile detailing around the top. I'd go with a dark grout so it didn't look filthy all the time. I'd rip out those cabinets and put in open shelving with bins. And I don't know what I'd do about the tub/shower, but it would be awesome. Honest. These are the cabinets of doom. And all of our bathroom things. You're jealous right now, aren't you? You want all of your house guests to see all of your cheapy bath products (although Justin uses some really fancy hair product in his hair. We could keep that out. It makes us seem cultured.). Who wouldn't? I'm not asking for a jaccuzzi, but this tub is so shallow, it barely covers our littlest. And it was painted badly at some point, so it's peely. And see that gross rubber stuff someone put on the bathtub/tile edge? It's not really properly placed anymore, and it's all sticky and black. I need to at least replace that, but it's one of those "eh, I'll do it when I replace the tile in the FAR DISTANT FUTURE" things. Ew. Also, note the cracked/badly repaired tile in the tub surround. We didn't do it. I'm not going to tell you about how this towel rack got broken. But it wasn't me. And I'm not being sarcastic. It really wasn't. If it were, I'd tell you all about whatever ridiculous thing I was doing to cause it. I try to keep my shameless over-sharing confined to my own hijinx. This light is so high class. The bulbs are so blinding that we can't have them all in at the same time. See that outlet? It doesn't work. When I want to take the time to blow dry and/or flat-iron my bangs, I have to do so in the bedroom, crouched in front of my tiny make-up compact mirror. This Bruegal print is above the toilet. Justin hates it, but Auden's "Musee des Beaux Arts" is my favorite poem. And it's covering the badly patched holes where we ripped out a very unsteady 1980's medicine cabinet that put fear in your heart any time you sat on the toilet. We've also got some of this. Old grout. Not holding up well. For inspiration photos, I'm looking at Retro Renovation. 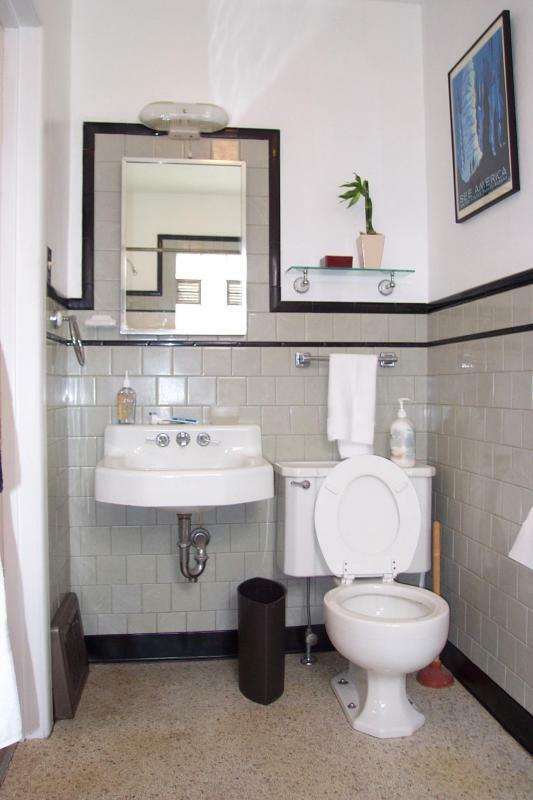 Googling "1950's bathroom" leads to a lot of heart-breaking images of people taking perfectly wonderful 1950's bathrooms and making them look like they came from a contemporary house. Blergh. Here's one of my favorites. You should definitely look at the full article. It's such a pretty bathroom. Thank goodness for Pam and Retro Renovation. There is no other website like that. It's such a huge resource for homeowners like me and Justin. This spread from Apartment Therapy is so so so wonderful. I want to move into either bathroom. 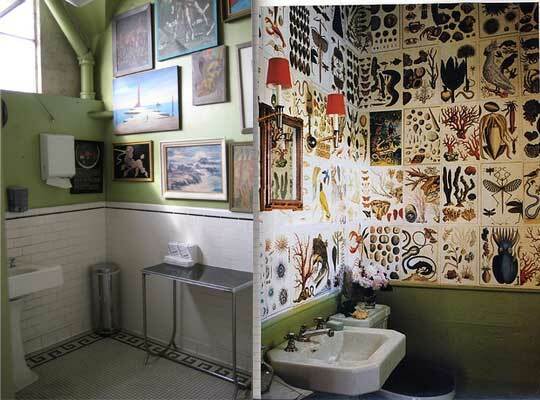 In useful terms, I love the tile in the image on the left. I'd totally do that in my bathroom. Yeah, it's going to be a while, unless I learn some DIY tiling skills during the Christmas break. Which would actually be completely amazing. And it could certainly be worse. Everything is functional, and there are no really horrific areas of damage. But this is the only bathroom we really use, so it would really be nice to give it a face lift. I don't want to fix it up right before we sell it (not that we will be selling it any time soon). I want to fix it up so we can enjoy it. That's the whole point, right? My daughter and SIL have that exact tile in their 1952 home. To make it worse, the previous owners had painted the walls, ceiling, and cabinets a light purple. For ages they were stumped about what to do to make it look decent till they could remodel. They found a Marimekko Tilkkula blue/green/maroon/dark grayish brown shower curtain at Crate and Barrel, painted the walls white and the cabinets the dark grayish brown, and it looks FANTASTIC. 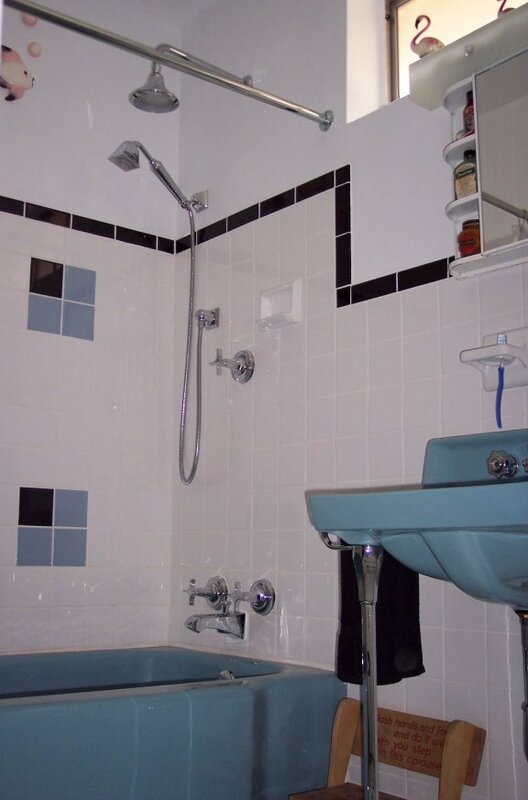 On the C&B site, it looks like purple, not maroon, in the curtain, but once they got it with that tile, it worked perfectly. Maybe grouting, repainting and finding the perfect shower curtain would work for you for a while too. Dana, thank you so much for the suggestions! I have wondered if paint would help. I also think a shower curtain would be lovely, but we have that sliding door on our shower, so no room for a curtain. 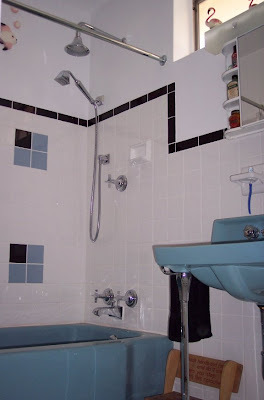 I would just take that down, but the height of the tub is so low, it would make a huge mess I think, plus I'd have to fill in all of the holes in the tile and tub. I definitely think grouting would be a good plan, it's just that whole "why put work into it if we are going to rip it out?" thing. I love love love Marimekko. Maybe I could try getting a curtain and hanging it over the open shelving (after ripping out those horrific cabinets. One of my big concerns is the floor. The tiles are basic, but they are just not well done. They are crooked in places, and the grout lines are totally uneven. It's so distracting! I totally understand the "why do anything since we're going to tear it out" thing. My daughter and SIL have said the same thing at least a hundred times, but the pale purple paint that looked more like a little girl's bedroom than a bathroom finally wore them down. :) I know you'll find something great to do to your space till you take the plunge and remodel.